Can A Dog Protect a Child from Asthma and Eczema? While many parents are busy sanitizing and disinfecting every square inch of their homes in preparation, a little bit of nature seems to be quite an effective immune booster for the arrival of a new baby. The good news of a bun in the oven does not have to equal bad news for the family pet. 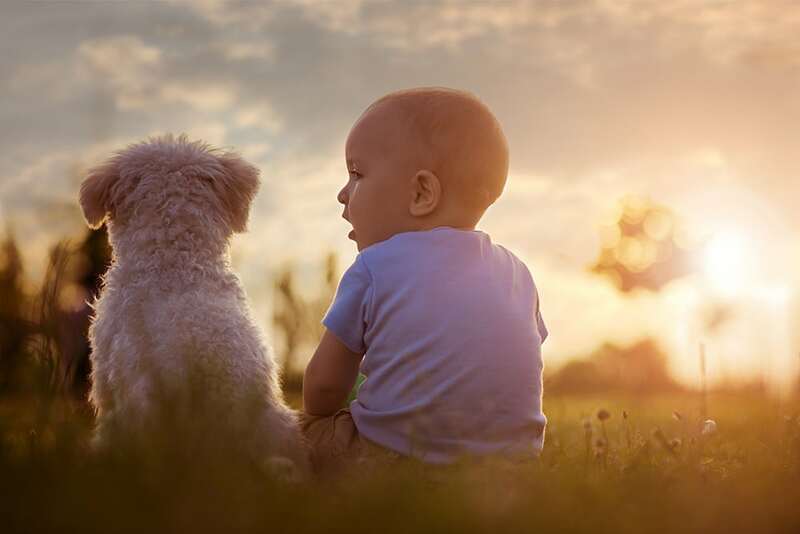 More than merely man’s best friend, studies have shown that babies born with a dog in their home have a lower risk of allergic eczema as well as asthma. This is particularly true when the dog was present during the mother’s pregnancy. Frequently reported among infants, eczema is a skin condition that results from a leaky skin barrier that causes the skin to dry out, leaving it more prone to inflammation from outside factors. Eczema often progresses to food allergies, nasal congestive allergies and even asthma. Allergist Gagandeep Cheema, MD conducted a study to determine whether or not a dog could aid in slowing down or possibly preventing that progression. It was found that the pregnant mother’s exposure to dogs, meaning at least one dog in the house for a minimum of one hour each day, significantly lowered the risk of the baby developing eczema before the age of two. This protective effect decreased when the child reached 10 years of age. In a separate study, two types of exposure were examined. Researchers found that exposure to the various bacteria and other elements of nature found on dogs offered a degree of protection against asthma. However, among children with a current dog allergy, this exposure increased allergic symptoms. It should be noted that a protective effect against non-allergen related asthmatic symptoms did still exist. The most common dog allergens are a result of the proteins found in the dander, saliva, skin flakes and urine of dogs. Additionally, outdoor dogs tend to accumulate pollen, mold spores, or other allergens, which are then brought indoors. Allergy testing may be advised to determine the specific source and cause of allergic reactions whether on the skin or in the pulmonary system. The primary symptoms of asthma include coughing, wheezing, shortness of breath, chest tightness, pain, or pressure. Known as an asthma attack, the onset of symptoms occur when a child’s bronchial tubes and airways constrict due to inflammation or mucous secretions from an environmental trigger. Working with an allergist to minimize exposure to environmental triggers can lessen the effects and symptoms of asthma and allergies. Keep the dog outdoors or limit access to certain rooms in the house. Wash hands after petting or playing with the dog. Bathe the dog at least once a week. Utilize a HEPA filter in the child’s bedroom and play areas. Obviously, parents want to take every precaution to keep their new bundle of joy happy and healthy. If no known allergies are present, exposing mom and baby to the naturally-occurring elements on a dog can offer a beautifully protective barrier against common childhood ailments. Extra care should be taken if parents are unsure of asthmatic risks or suspect that an allergy might be present.